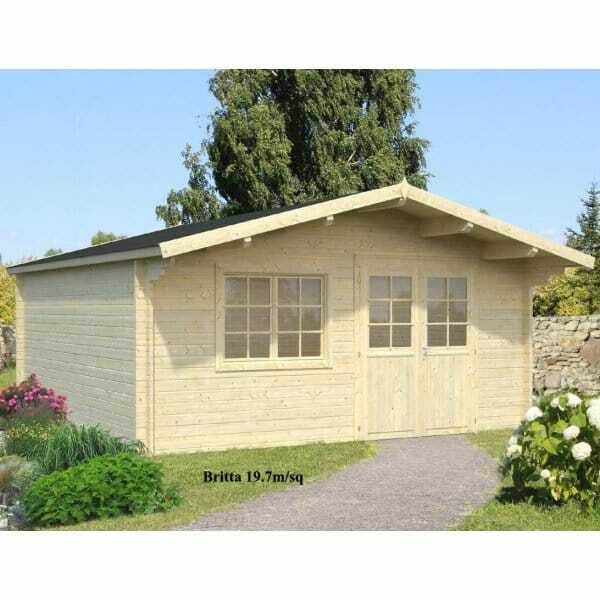 Palmako Britta 19.7 & 22.3m² Log Cabins : The Palmako Britta 19.7 & 22.3m² Log Cabins features two sizes:1) 4.8m x 4.2m 2) 4.8m x 4.8m Both Sizes are PLUS Front Roof Canopy and built in 40mm wall planks. This log cabin comes with double doors and a large single window to the side of the doors (Can be built with Door to Right or to Left and window positioned accordingly). The stylish cabin has a front canopy of 1.35m offering a sheltered area from which to enjoy your garden. A versatile and attractive cabin - it is an ideal building from which to enjoy your garden from Simply Log Cabins.